More than 25,000 fans turn out to see cricketing icons at Citi Field in New York, Nov. 7, 2015. More than 25,000 fans, mostly expats, flocked to New York's Citi Field to witness a cricketing spectacle on a chilly Saturday afternoon. In an entertaining game that lasted a little over three hours, Indian batting legend Sachin Tendulkar’s Blasters took on Australian balling legend Shane Warne’s Warriors. “It’s exciting to see all the stars coming together to introduce the game to the U.S. It’s exciting, also, to see Waseem Akram,” said Mohammad, a Pakistani-American who enjoyed the game with a group of his cricket-crazy friends. 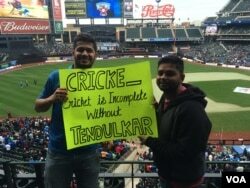 Cricket icon Sachin Tendulkar's fans hold a sign at Citi Field in New York before the start of an all-star contest featuring retired stars, Nov. 7, 2015. Though their average age was above 35, the legends did not disappoint. From Waseem Akram’s inswing, Akhtar’s pace and Murali’s doosra to Sachin’s straight drive, Ponting’s flick, Sehwag’s sixes, Warne’s googly and Johnty Rhodes’ fielding antics, the game had it all. It was a feast for an average cricket follower in America who is deprived of watching live, quality cricket. New Jersey native Padma Sharma never expected to see her favorite cricketers live in the U.S. “I am only here to enjoy cricket and never imagined it would happen,” she said. But the biggest attraction for many fans was the "God of Cricket" — Sachin Tendulkar, widely regarded as one of the most popular sports icons in the world. Fans cheered his name at every possible opportunity. “It’s a dream come true just to see him live. It was also great to see old rivals playing together,” said Anand Balachandra, who drove from Philadelphia to witness the battle between his cricketing idols. Spin wizard Shane Warne had a great day as he took three wickets and his Warriors easily overcame the challenge of scoring 140 runs in 20 overs. The Warriors scored 141 in 17.2 overs, thanks to former Australian captain Ricky Ponting’s 48 not out. He hit three sixes and fours in his 38 ball innings for the Warriors. For the Blasters, Indian batsman Virender Sehwag top scored with 55 runs in 22 balls. He hit six sixes and three fours. Warne was thrilled to play in front of thousands of his fans who had packed a baseball stadium in New York. “It was a pretty amazing day,” he said. “The whole idea of Cricket All Stars is to get as many people from different countries to enjoy it, to globalize cricket,” Tendulkar said. The Indian batting legend felt that the atmosphere was as electrifying as the Mets baseball game he'd witnessed a few days ago. 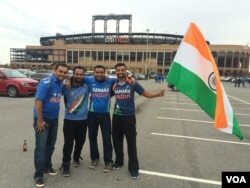 Indian fans get set for the game at New York's Citi Field, Nov. 7, 2015. The Cricket All Stars — a group of 28 retired players from Pakistan, India, South Africa, Australia, Sri Lanka, West Indies and New Zealand — are trying to re-create the magic that entertained the world of cricket followers during their playing days. They are participating in three exhibition matches across the United States. The next matches will be at Houston’s Minute Maid Park on November 11 and at Dodger Stadium in Los Angeles on November 14. New York-based sports marketing company Leverage Agency joined with United Sports Associates to organize the series. The icons spent a week in New York interacting with fans and young cricketers. By some estimates, there are about 200,000 cricket players in the United States, playing in more than 150 leagues. Most of these players are expats who continue to follow their passion. Capturing the attention of the average American sports fan remains cricket’s biggest challenge, and the star power of Cricket All Stars was expected to create a big buzz for the sport. Saturday’s game was mostly attended by cricket-loving South Asians, Australians and Caribbeans. Houston and Los Angeles may not be very different. “Cricket All Stars will definitely score big from the nostalgia or a personal standpoint, but ... for the general casual U.S. fan who likes his NFL, his baseball, or his basketball, I don’t really see much impact being made, particularly from the standpoint of the prices that are being put out for these tickets,” said ESPNCricinfo’s U.S. correspondent, Peter Della Penna. Only 12 percent of the seats in these venues are priced at $50, while the rest range from $75 to $175. Della Penna believes the higher ticket prices may have discouraged those not familiar with this sport. U.S. Youth Cricket’s President Jamie Harrison, who grew up as a baseball lover, agrees that pricing could have had a role to play, but also feels that a little more advance promotion on mainstream American media would have been helpful. Moreover, younger players and fans would have liked to see today’s cricketers rather than watching retired legends. Experts feel that cricket should have followed the soccer model, where current players and clubs play exhibition games during the off-season. New York Times reporter Victor Mather believes that compared with soccer, cricket is a complex game and a little hard to sell, but he feels that thanks to such events, it will continue to grow. “I have been living in New York for 30 years and this is the biggest thing cricketwise we have ever had," he said. "So you increase people gradually. Somebody who had no interest now has a little interest." Today’s response to the game was pretty encouraging for the sport. When asked whether this could become an annual event in the U.S., Tendulkar was positive and said, “We will make every effort to do it." Will Cricket Score Points with Americans?